I'll put my Microsoft disgust up against that of any other geek. So watch out for the end of days, because I have something ni ... n... nuh ... not so bad to say about Office 2008 for Mac (about $80-90 on Amazon). 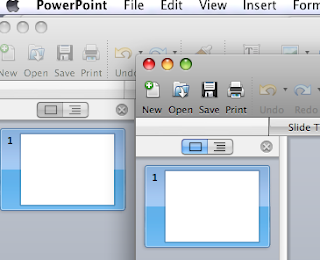 Yeah, two PowerPoint windows open at once. You're not impressed? Then you don't use Office on Windows, where the #$!$# Windows are glued inside the app window. You can't move one presentation or spreadsheet to one monitor, and a different one to a second monitor. I must say more, even though it pains me so. Three licenses. In case you're wondering, this is effectively 3 machine licenses -- you're not asked for a license for each user on a single machine. The multiple service pack updates are a pain, but the install was smooth. None of Adobe's problems with non-admin users. The only gotcha is you need to go into Entourage (dead and rotting software) and make sure every feature is turned off lest it seize control from iCal (undead and rotten software). Pigs not flying yet? How about performance. Office 2008 is responsive on my G5 iMac. The Apps are much more Mac like than, say Aperture -- or many of Apple's products. The file formats are de facto standards (I wish this were not so). Ohh, yeah. No button bar. Thank god. I haven't made heavy use of it. I'm sure there are bugs. Even so, it's good enough that I'm willingly using it. Never thought I'd say that about a Microsoft product*. * Ok, So I love Windows Live Writer. But that was developed outside of Microsoft and seems to have been abandoned by the borg. Then, about a month later, I tried to use Office 2008 PowerPoint on a real presentation. This time I was using my quad core iMac with Snow Leopard, my earlier experience had been on an old G5. It was unusable. The keystroke delay is intolerable. I wasted an hour then gave up and finished the work using PPT 2003 on my seven year old XP box. I think it might work well on a G5, but it doesn't work acceptably on Intel machines. I'm removing Office 2008 from my machines. I'll install iWork. Update 4/6/2010: I was working on a presentation that seemed fine. Then I added text to a graphic slide. Instantly all text input became extremely slow. I reset the theme and text lag cleared again. I think this is a theme corruption bug of some sort related to PPTs that have moved from XP to OS X. There are some Office 2008 forum discussions of the type lag bug. Update 4/6/2010b: I think there may be both theme and master slide associated bugs. I don't see any way in the view master slide UI to remove master slides (reset to standard). There are few to no master slide related help topics. PowerPoint 2008 is not a serious product. I expect the user base is becoming very small -- basically academics who don't use Keynote. I've uninstalled Office 2008, I'm going to use Office 2003 in my Fusion VM and I'll evaluate iWork and Keynote. Update 4/8/10: A colleague tells me that PPT for XP has the largest and most intractable code base of any Microsoft project. I'd not have guessed that; maybe it explains why the Mac version is so bad. Keynote does a nice job of importing PPT files, but for now I'm using Fusion. I will probably buy iWork. Now I understand why Jobs insisted Apple develop Keynote, and why the other iWork apps followed Keynote. I can't seem to find this for less than about $110. If you have a link, let me know. Another thing to love is that it does away with some of the .docx and .xlsx formatting wonkiness that occurs when you revise any such document produced on Office for Windows 2007 using Office for Mac 2004. With many of my colleagues, after I've ruined their document using Office 2004, they can no longer save it in Office 2007. That seems to disappear when using Office 2008. Yes, it's showing as $110 on Amazon for me as well. I must have caught some kind of sale - or maybe I imagined hte price.